description: A maroon colored sign with pink neon accent around the top edge for light. A square mesh pattern surround the neon for protection. A metal track holds up to ten interchangeable letters or numbers. This sign has cream colored letters spelling, "YOUR NAME." 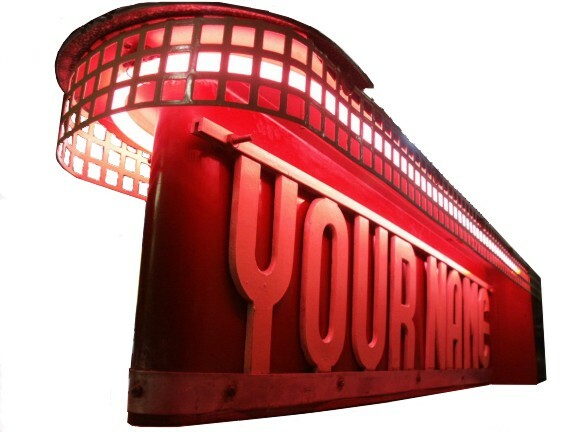 information: This salesman sample neon sign allowed the Kels-O-Sign company to show their clients what they could do, without having to make an individual prototype for each customer. It was also small enough to allow a traveling salesman to take it along with him on the road. A convenient handle at the top of the sign allows for easy transport.